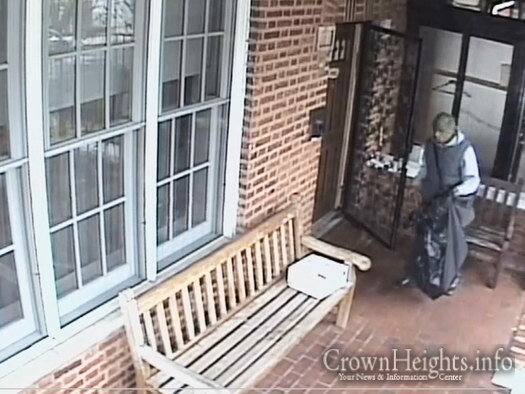 Yesterday, a man went on a thieving spree in Crown Heights, attempting to steal from a Kingston Avenue store and stealing multiple packages from people’s doorsteps. 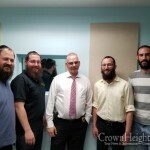 Shomrim volunteers cornered the man into his apartment, but he still managed to evade arrest. The incident began yesterday, Tuesday, April 12, in the afternoon. Shomrim received a call from the manager of First Quality Paper Goods, located on the corner of Crown and Kingston, that a man attempted to run off with two cases filled with merchandise. The store manager confronted the man and retrieved the stolen goods, and then followed him as he fled down Crown Street towards Brooklyn Ave., while calling Shomrim. By the time Shomrim arrived, the man had disappeared from sight. 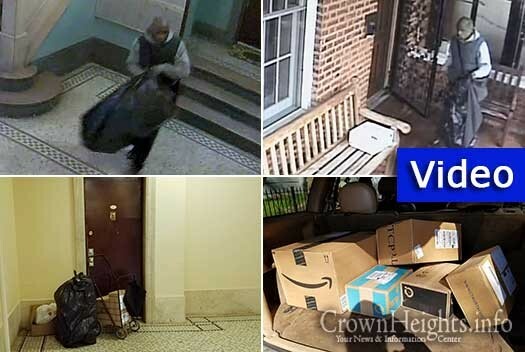 Unbeknown to Shomrim at the time, the man had escaped into an apartment building on the corner of Brooklyn Avenue and Carroll Street, where he want on a “stealing rampage,” filling up a garbage bag and a shopping cart with packages left at people’s doorsteps. About 20 Minutes after they got the call, a Shomrim volunteer spotted the suspect pushing a shopping cart filled with boxes and carrying a garbage bag (which was later revealed to be filled with even more packages – all from the same building) over his shoulder, near the corner of Kingston and Carroll. 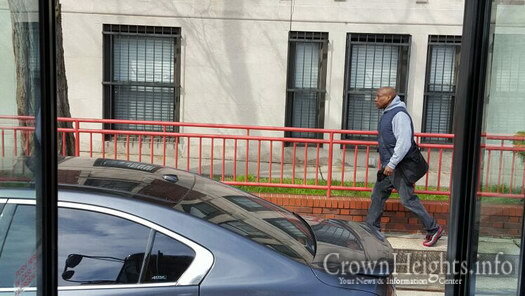 The suspect, realizing he had been identified, fled down Carroll Street towards Albany Ave., and entered an apartment building on that corner. 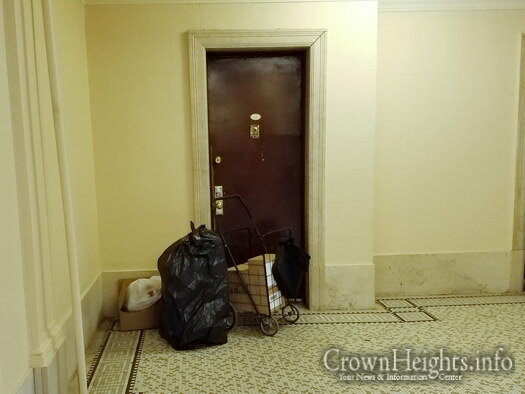 The volunteers followed him into the building, and just managed to see the door of an apartment closing, with the cart and garbage bag left outside the door. A quick glance at the cart and bag revealed that they had been stolen from the building on Carroll and Brooklyn. 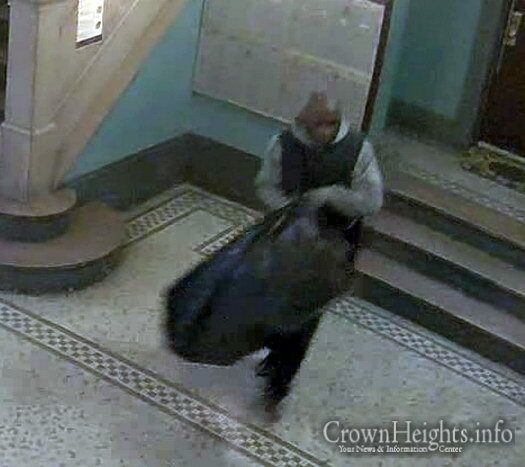 CrownHeights.info later obtained surveillance footage from the building showing the man going around with a garbage bag and stealing packages from residents’ doorsteps. Armed with irrefutable evidence of a crime committed, and knowing the man was in the apartment, Shomrim called the police, and stationed a couple of members outside near the apartment’s windows to ensure the suspect did not escape. Police arrived and knocked on the apartment door. A younger man answered, and when asked about the suspect, “played dumb” and gave vague answers. Police asked if they could search the apartment, and he responded that the apartment was rented by the bedroom to different tenants, and as such he could only allow the police to search in specific parts. Unsurprisingly, the limited ‘search’ did not turn up the suspect. 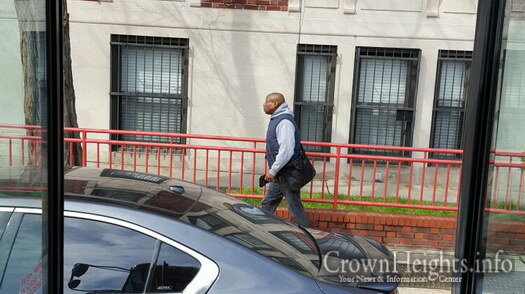 Based on the information and photo obtained from Shomrim, police identified the suspect as a middle-aged African-American man with an extensive criminal history, who indeed resides in that apartment. The Shomrim volunteers who were keeping watch outside saw the suspect peeking through the window several times, but despite all this, the police officers said they had no cause to believe the man was inside the apartment. They requested that a criminal report be filed, and left the scene. 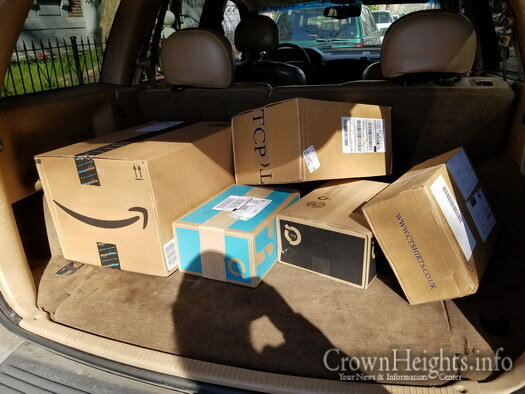 Following this incident, Shomrim were notified by a Crown Heights resident that a package had been stolen from their doorstep the day before, on Monday, and that the perpetrator had been caught on surveillance camera. Inspection of the footage confirmed that it is the same man. The packages stolen on 4/13/16 left in front of the apartment Shomrim observed the suspect flee into. The packages recovered and begin returned to their owners thanks to Shomrim. 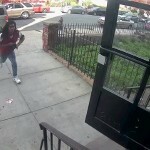 The suspect walking on Brooklyn Avenue, captured on camera by the manager of First Quality Paper Goods after attempting to steal two boxes from his store. The suspect captured on camera stealing from a porch on Crown Street on 4/11/16, the day before. The suspect captured on camera inside 1324 Carroll Street on 4/12/16 stealing packages throughout the building. Can you please post the link to where can complain regarding this police refusal to serve and protect. Stealing mail is a federal crime. Unless it is the feds in the first place who set up this secret underground allience between NYPD, USPS and the National Association for Shoplifting. 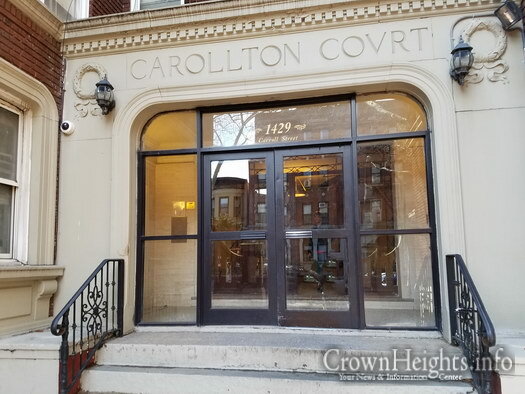 The Crown Heights Theurum: Impulsive takers seem to attract impulsive shoppers in an unconscious bid to recreate the experience of getting klep in order to get even. Hmm. At least this explanation beats the Odepious Complex model. Next time mayor or police commissioner have a public appearance taking questions, ask the question as to why police refuse to arrest burglars despite unequivocal evidence. If this question is posed in front of enough media that will give publicity, they will have no choice but to address. Suckers we are paying million + for a house here to then pay 300K to renovate- and then have scum like this man degrade quality of life to the point of having to hold your breath every time a package is mailed to your home. The cherry on top is the disinterested cops who failed to nab the thief here red-handed. An arrest would have put this guy on notice but even that was too big a deal for them. I am wondering, what will it take to raise quality of life back up to decent level? Same guy stole my package during March. I obtained video and pictures from management. Filed a report with the US Postal Inspector. Nothing came out of it. Once some neighbors were blasting music using 7 foot speakers. The 71 came but they turned the music back on when the cops left. Then I called the fire department and the music stayed off. if calling the cops doesn’t work, call the fire department. If so, what you have here is a massive building code and fire code violation. This is called an “Illegal SRO”. It’s a big deal to the right code enforcement officers. This should immediately be reported to the NYC Department of Buildings, and to the NYC Fire Department. That should get the whole apartment shut down. Let him and his friends pay the price! If you use priority mail, it is insured for up to 50 dollars. In additional to postal fraud, file a claim online with USPS to get your money back. It should be reported to the landlord of the apartment building that whoever is officially renting the apartment is, essentially, sub-letting his apartment by the room. 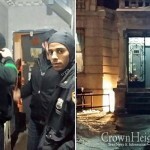 the police in crown heights are incompetent/anti-Semitic/corrupt this would not be tolerated in BP or in Willy. Only an idiot would pay a million, renovate and put up with crime, alternate side parking, filth and our wonderful cops. There are safe beautiful places to live with yeshivas etc. Get out and get rid of most stress. Yup might have to get paid on books and, pay tuition but worth it. Before putting up an excuse of an Eiruv to kick down his door parading in KGB fashion, grownups normally first require sane evidence for a judge’s decision wether or not to issue a warrent depending on the wider history of circumstances. Also, normal adults knock before entering. He doesnt need to be declared Kleptomaniac to have animalistic rights. Even if “Kleptomaniac” was a real thing, even if it was so real you could pet it, that’s still no excuse to take the law into your own hand and tresspass into an’other’s personal space, just as you wouldn’t want it to outreach its paws into your private property. It’s still a creature designed by hkbh, merachem al habrios, and for giving them rights, even when theyre wrong. The picture of the front of the building is from Albany & Carroll, not Brooklyn & Carroll. Was he stealing from 1429 Carroll or not?